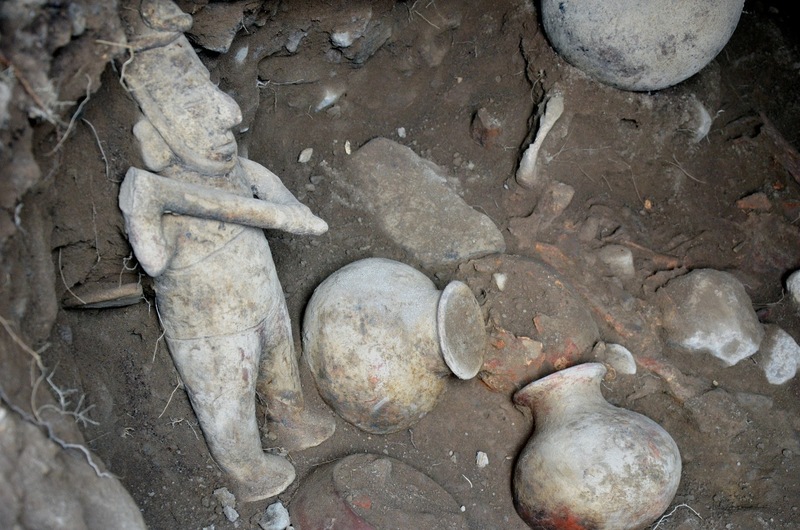 Archaeologists broke a 1,500-year-old protection streak when they discovered an intact shaft tomb guarded by a shaman figurine in Villa de Alvarez in the western Mexican state of Colima. 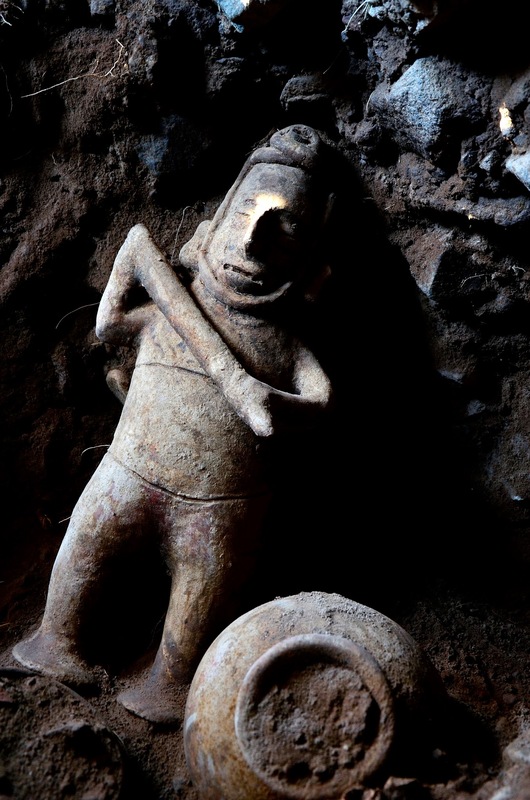 Although the shaman, characterized by his long face and holding a handled weapon of some kind that may have been an axe, couldn’t keep the archaeologists out, he did an exceptional job protecting whoever was buried there from being desecrated by looters. Intact shaft tombs are rarely found because the grave goods they contain are highly sought-after artifacts. The shaft tomb was found during an archaeological exploration of 10 hectares of land which has unearthed multiple cist burials containing human and canine remains that date to late in the Comala phase of development, 400-600 A.D. Near the cists, archaeologist Marco Zavaleta found three flat stones that were lifted to reveal the vertical well that is the entrance to the shaft tomb. The tunnel is almost five feet deep and leads to a tomb lined with a solid layer of tepetate, a kind of volcanic rock. It’s the rock that dates the burial to earlier in Comala period, between 0 and 500 A.D. Inside the tomb archaeologists found six ceramic pots of varying sizes and shapes and one gourd which were interred as offerings to the gods. The pots will be analyzed for any organic residue or remains, like food or seeds. Standing proudly upright in front of the tomb was the star of the group: a 19-inch shaman figurine. His elongated head is suggestive of intentional cranial deformation, a practice that has been confirmed in skeletal remains from this period. 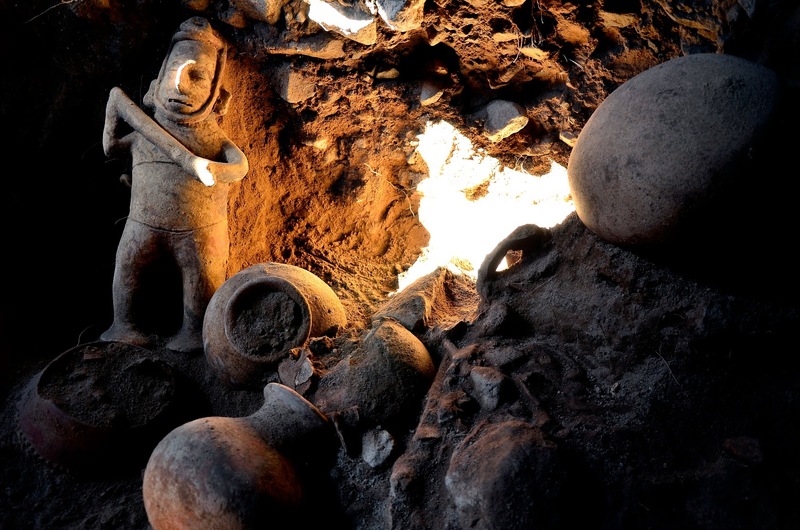 Archaeologist Marco Zavaleta believes the shaman was ritually “killed” by being deliberately broken before placement in the tomb. That’s why his weapon is incomplete and why his headdress is missing standard elements like a horn. Whoever he was protecting must have been part of the city’s elite. Only the wealthy at the top of the social ladder had the power and money to commission these kinds of elaborate funerary structures, and they had the wherewithal to get people (and animals) to accompany them on their voyage to the afterlife. The skeletal remains of one or two adults were found on either side of the tomb vault, which is about six and a half feet in diameter. They’ve been disturbed, indicating that they were removed from their previous location to make room for another burial. The main burial was found in a lower level of the excavation and is an adult male lying on his back. Outside the tomb the partial remains of dogs and children were found, and one infant appears to have been thrown down the well. Animal teeth found scattered inside the tomb may have been part of a necklace the infant was wearing when sacrificed. “An important piece of information in this particular case is the immense presence of children. They were all placed around the tomb. There are practically no adult individuals. We would have to analyse the relationship between the children, the shaman and the dogs, who are protecting and preparing (for burial) but why were these children placed here?” [archaeologist Rosa Maria Flores] said. The number of children buried in the tomb was not clear, archaeologists said. 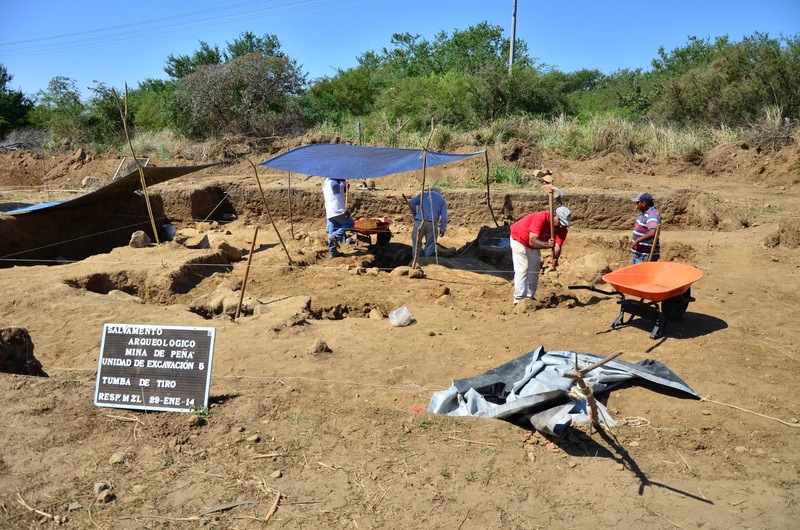 The discovery of the intact tomb has provided University of Colima computer students and teachers with the opportunity to survey the site and create a 3D virtual model of it. Using a computer, a game controller and specialized software that converts video images into photogrammetric data, the team has been able to create a virtual copy of the well, vaulted tomb and artifacts. This entry was posted on Sunday, March 23rd, 2014 at 9:38 PM	and is filed under Ancient. You can follow any responses to this entry through the RSS 2.0 feed. You can skip to the end and leave a response. Pinging is currently not allowed.